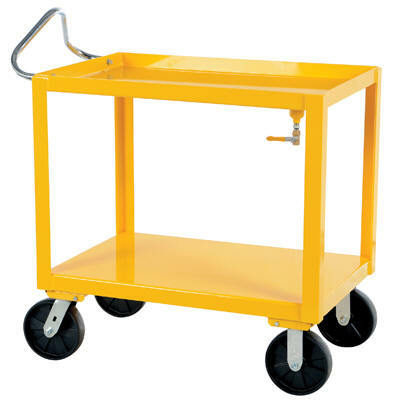 The Ergo-Handle Cart is constructed of heavy-duty steel to handle uniform loads up to 4,000 pounds. 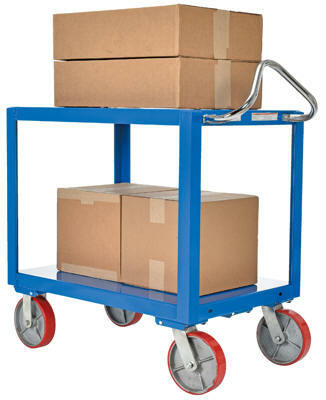 The patented ergonomic handle decreases fatigue by allowing the operator to easily maneuver the cart. Rolls on 2 rigid, 2 swivel 8" x 2" casters with roller bearings. Invertible bolt-on chrome ergonomic handle designed for individual height comfort and handling of long loads. The Ergo-Handle Cart with Drain has the patented ergonomic handle that decreases fatigue by allowing the operator to easily maneuver the cart. The ergonomic handle has an invertible bolt-on chrome design that is great for individual height comfort and handling. The top shelf has a perimeter retaining edge that is slightly slanted towards the drain hole which gathers debris. To use the drain system, simply turn the ball valve to empty liquid into container of your choice. Each unit rolls on two (2) rigid and two (2) swivel casters with roller bearings. 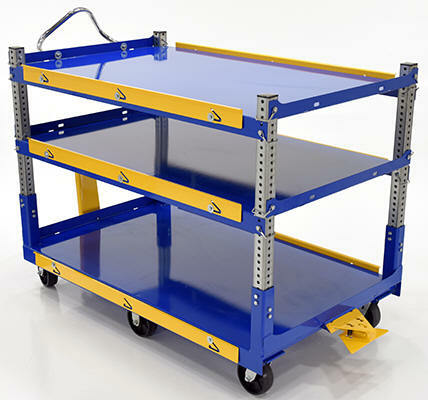 The adjustable ergonomic cart is the perfect asset to a number of facilities including shipping and handling to hospitality. A strong construction with a tall handle diminishes bending and twisting while loading and unloading products. The top two tiers can be adjusted in height with a simple pull of a pin to let larger sized products be transferred securely. 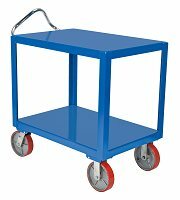 The unit rolls on the users choice of glass-filled nylon or mold-on rubber casters for a smooth transition.